Having completed 22 Future of Work MeetUps in cities of all types across California – urban, rural, suburban and affluent to struggling – I can attest to a common angst as communities anticipate how artificial intelligence and increased automation will impact the workplace. Employers and workers both want a playbook to future-proof and increase economic resiliency. Last week, Walmart Inc. showed one playbook for increasing resiliency that others should study and follow. The company announced it will subsidize a college education for its associates, with their front-line training workers contributing $1 per day for the length of the online program. Their retail associates in the U.S. can earn affordable, quality associate and bachelor’s degrees in Business and Supply Chain Management from one of three colleges. This workforce upskilling strategy comes at the same time that Walmart is testing shelf-scanning robots, named Bossa Nova, which I had the opportunity to watch in motion at the company’s “Store of the Future” in Bentonville, Arkansas. I had the honor of participating in a panel discussion entitled “Lifelong Learning for the Future Economy” last week at the company’s annual shareholders meeting. The conversation was focused on the social challenge and need for accessible, affordable pathways to higher education. As panel moderator Kathleen McLaughlin, president of the Walmart Foundation and chief sustainability officer, pointed out, the newly launched education program goes beyond Walmart; it fits into a broader conversation about the future of work and how organizations across the retail ecosystem can collaborate to ensure workers have access to the type of continuous learning that will be required in the future economy. Workers face a number of barriers, among them financial challenges and fitting college studies in between work and life responsibilities. Time has become scarce. McLaughlin shared during the panel discussion that nearly half of all college students are financially independent, and 25 percent have financial dependents. Also, she said, 75 percent of today’s college students juggle work, parenting, or both. Walmart shows us how employers can team up with their workers and educational institutions to help remove these barriers. When employers co-invest in educating and training their employees, they not only help remove the financial barrier to a college education, but their company reaps benefits, as well. Panelist Danette Howard, Ph.D., senior vice president and chief strategy officer for the Lumina Foundation, said her organization has seen that employees who received an education benefit were more likely to be retained longer, be promoted, or make a lateral move within the company. Employees also were more likely to have fewer unexcused absences and be more engaged on the job. For their part, educational institutions can work to make a college education more accessible and flexible for workers who juggle jobs and families. The California Community Colleges is working on creating a statewide online community college with career education programs as its focus. A key element of the student experience will be the ability of workers to receive college credit for prior related work experience. According to the Center for Adult Experiential Learning, adults who receive at least some credit for prior learning are 2.5 times more likely to graduate than if they started from scratch. It is no longer a matter of wanting to earn a degree or a credential – it’s a matter of needing to earn one to make a livable wage. By 2020, 65 percent of all jobs in the economy will require some education beyond high school, according to the Georgetown University Center on Education and the Workforce. Panelist Rachel Carlson, CEO and co-founder of Guild Education, the education benefit company that is working with Walmart, shared that 64 million Americans today do not have a degree or credential. With technology changing the world of work at a fast pace, workers’ skills have an increasingly shorter shelf life, meaning they will continue to need booster shots of education to keep up. 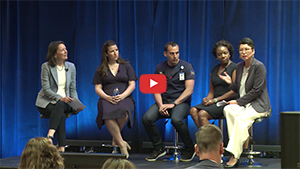 Walmart paired workforce upskilling for its employees with its continued automation efforts, an inoculation to ensure resiliency for both the employer and the worker in the future to come. Van Ton-Quinlivan is a nationally recognized thought leader in workforce development whose experience spans the private and public sectors. She was named a White House Champion for Change by the Obama Administration and received the California Steward Leader Award from the California Economic Summit.